Family owned. Caring about your Experience and Satisfaction. StarFine Furniture and Mattress is located right off Highway 45 on Broadway Avenue J in the quaint older area of Galveston Island. Ben Jay Stein retired from the daily duties in 2016 and turned the reins over to his son, Jody Stein. Jody, together with his wife Kim, now represents the 4th Generation of this family-owned and operated furniture and mattress store. Whether you are just visiting for the weekend, have a second home or live on Galveston Island year around, StarFine can outfit your space with the look and feel you desire with a unique look at a great price! We offer over one thousand items in store to browse through and try out. If you don’t find exactly what you are looking for, we have hundreds of custom-order options and a Free In-home Design service to get your entire home looking just right! In 1907, David Goldhirsh immigrated to the United States. He landed in New York, and, after six years, moved to Galveston. He began working at M. M. Bleich’s corner grocery store. Seven years later, Mr. Bleich loaned David the money to start Star Furniture. 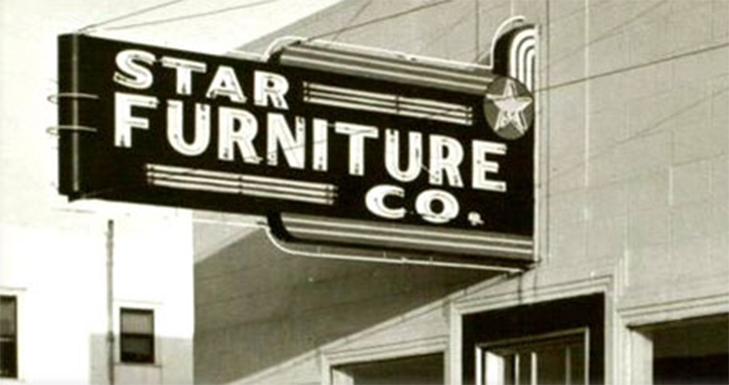 The original Star Furniture was a “mom and pop” business, located at 414 25th Street in Galveston. The only other employees were David’s children, Simon and Frances. By 1941, business was booming, and Star Furniture moved to a three-story building at 2424 Market Street. In 1944, Frances married Marvin J. Stein, and Marvin joined the business in 1946. Originally, he was “just going to take care of the store for a week,” while his father-in-law went on vacation. Sixty-six years later, he’s still working at the family business. Marvin and Frances’ son, Ben Jay, proudly continues the family tradition of bringing quality furniture to Galveston County. His son, Jody, joined the business in 1997, and today he enthusiastically serves as Vice-President of Sales and Merchandising.